We all like to tell ourselves that animals are pure, innocent, and lovely. That humans are awful, and animals are better than all of us. But here’s the truth: the animal world is harsh. Animals can be cruel and heartless. They only care about themselves, and will casually break your heart and destroy your dreams like it’s nothing. Need proof? Please observe the Nat Geo Channel’s latest documentary clip/soap opera, titled simply ‘Homewrecking Penguin’. 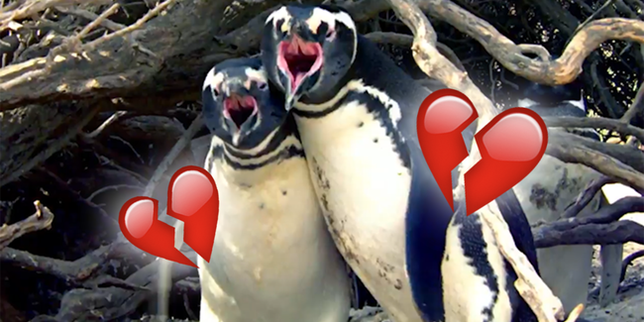 ‘Homewrecking Penguin’ documents the love triangle between one penguin, his wife, and a third penguin. ‘This husband has come home to find his wife with another penguin,’ explains the voiceover. ‘He flips out. The video explains that while most birds have hollow bones in their wings, penguins’ flippers contain solid bones that they can use ‘like baseball bats’, delivering eight blows a second. The male penguins battle, then call out to the female penguin, asking her to decide. The husband penguin then follows the couple home to deliver a ‘beak attack’ on the male penguin. Things get violent. Both penguins are quickly streaked in blood. The husband makes one final, desperate plea to his wife; the mother of his children. ‘But she’s got no time for losers,’ says the voiceover.